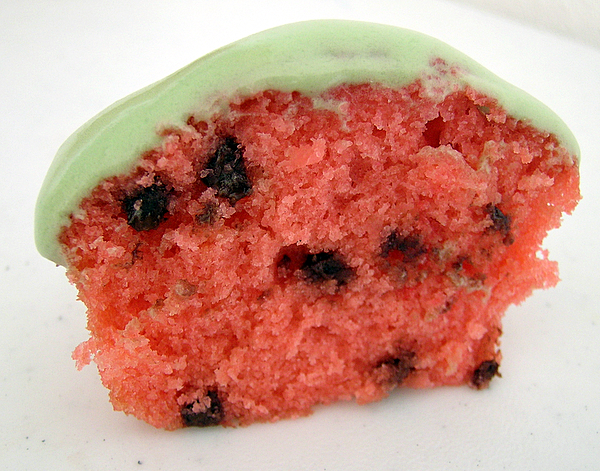 I thought it was a cute idea that I had for these watermelon cupcakes, so had to try it out. I used Magnolia Bakery's vanilla cupcake recipe, but halved it to get one dozen cupcakes instead of two (though I ended up with 14, actually). I added 10 drops of red food coloring (give or take a drop) and 1/4 cup plus a tablespoon or so of mini chocolate chips. These are too cute! These would be perfect at any outdoor party! So Precious!